The world of text is becoming more and more obsolete. As we dive deep into the second decade of the new millennium, embracing new technology is simply another step towards the next great revolution. In this age of electronics, there are always new products to support the older products. For instance, the analog clock made headway for the digital clock and the watch. The record player made headway for the tape and the compact disk. In the same way 2-dimensional printing has made headway for the 3-dimensional printing revolution. This process was not instant however. The idea of 3D printing has been around since the 1970’s. For years, large and expensive machinery with very limited capabilities crafted small and untidy pieces in hopes of one day perfecting the process. While this was a great display in additive printing at the time, the machines now cost substantially less and bring about different products of all different shapes and sizes. So why doesn’t everyone already own a 3D printer? It is clear that despite recent drops in prices, these printers are way above the middle class budget at around $1500.00 a piece. Fortunately, the market is growing and the supply of these printers is on the rise. 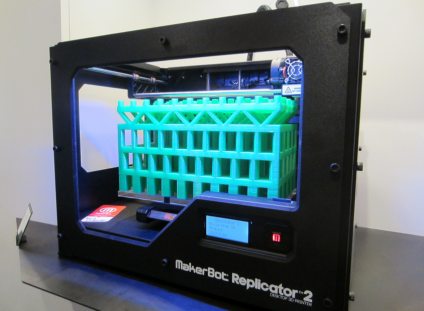 Within the next three years, there will be a 3D printer in every other home if not in most. What purpose do 3D printers serve? Other than creating model toys and replacing board game pieces, this innovation doesn’t really seem useful, right? Actually, with the proper measurements of any particular piece of anything, you can replicate it. If you need a model of a building or a car, instantly it will be right in front of you. Nothing is impossible with this machine. With new updates to the printer every year, it could produce entire pieces of furniture out of metal, wood, or silicone plastic by 2015. All in all, the benefits of this printer outweigh the high price. By the year 2015, the printer will be like a home computer in the year 2000. By that point, the world of 3D printing will be all too familiar to our schools and even our workplace. They will be used for all and everything. This entry was posted in Entrepreneurial, Featured, Gadgets, Trending and tagged 3D Printer, Maker Bot, Prototyping. Bookmark the permalink. ← Will the Tablet really be the death of the Laptop?